A health trust says it is taking action to tackle a £27m deficit and still give patients the best care. North Tees and Hartlepool NHS Foundation Trust, which runs the university hospitals of Hartlepool, and North Tees in Stockton, is looking to make new efficiencies and work with partners and other teams of clinicians to ease pressure on services. PM Theresa May will be receiving a letter from North Yorkshire's Health Watchdog over Harrogate's 12.8m NHS deficit. The Mail reported yesterday how the trust had aimed to end the last financial with a £3 million surplus. But it actually had a deficit of over £27 million. A trust spokesman said: “Our priority is and always will be to provide the very best care to our patients and to continue to improve. “Like many trusts across the country, we are facing on-going financial challenges. “We are taking action to meet our financial targets whilst always ensuring patient care is the very best. “Our staff are working with other NHS leaders and with partners in the region to achieve a new way of working to deliver services and to address the challenges we face. 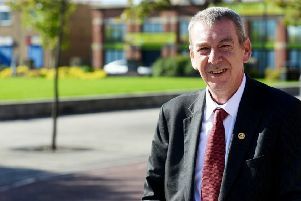 Hartlepool MP Mike Hill said the deficit showed the health service is ‘chronically underfunded’. Prime Minister Theresa May has announced a £20 billion for the NHS a year by 2023 as a 70th birthday present for the service. The trust said it has celebrated many successes over the last year including the opening of new urgent care units at Hartlepool and North Tees hospitals which it says have contributed to being one of the top performing trusts in the country for emergency care. The trust spokesman added: “The NHS has become one of the country’s proudest institutions and the envy of so many countries and healthcare systems around the world. “It will continue to grow and evolve over the next 70 years and beyond. “We are proud to have such dedicated and committed staff.